I wrote this in March as a tribute to my dear friend Don, commemorating his life and the love he had for “the Vic”. I often refer to the relationship the two had with the Hot Rod Hill Climb as bookends. 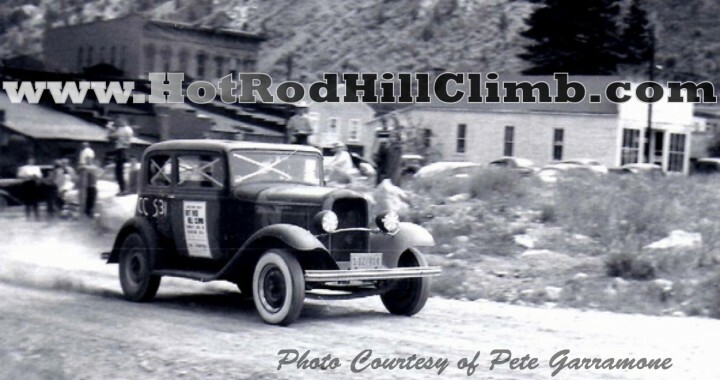 At age 17 Don had the Vicky in Georgetown for the first Hot Rod Hill Cilmb in 1953, shortly after he pulled the flathead heart beat out of it and the Vicky followed him life-less during his years of career, family and children. Until he finally devoted a few years to see his girl all dressed in red, the way he had always dreamed her to be, that was 2005. It was a joy to have Don drive the Vicky to Georgetown September 2013 for the 60th Anniversary event, it was a bookend that marked the 62 years those two shared. Don Joy’s battle with Chronic Obstructive Pulmonary Disease (COPD) is over. He passed away March 1st, 2014 in his home. It only seems appropriate that he wait until March being that was his page in the calendar (pictured below). Shockingly (or not), Don’s calendar in his kitchen had been hanging on March since November when I delivered it to him. 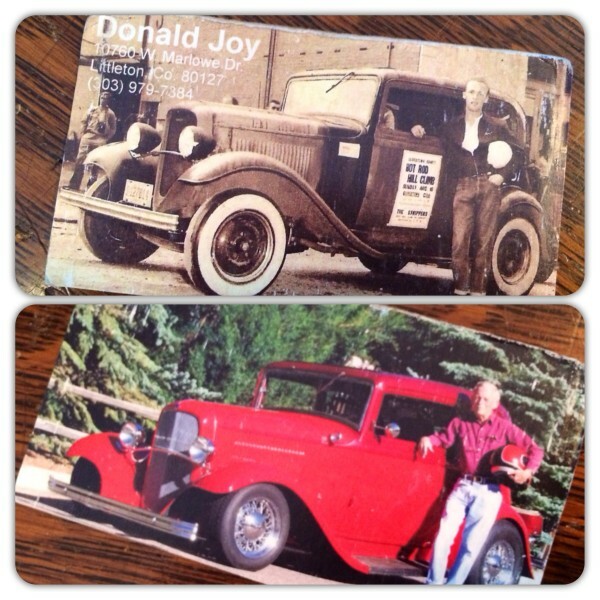 Last year on my hunt for information on the 1953 Hot Rod Hill Climb, nearly everyone that I ran into asked, “Have you talked to Don Joy?” Don was not shy about letting people know he was there in 1953, in-fact his business card was emblazoned with that famous photo of him standing proudly by his 1932 Ford Victoria on Rose Street downtown Georgetown. On the flip side is Don 54 years later with his beloved bright red Vicky. On our first in person meeting, like he did with everyone that asked about his car, he handed me this card. As the 2nd owner, and 62 years at that, he had every right to brag! He was proud of his family and especially his grand daughters, his black labs and the Joy ranch in Evergreen where he spent much of his earlier years. We sat at the table flipping through his ‘Picture Books’ and laughed about his lifetime adventures. He had documented the life with ‘The Vic’ well. He showed me a photo of him in the September 2010 Good Guys Gazette, and explained how he had to kick the guy in the shins to get his story and photo on paper, “Mike, how many people do you know that have owned a car for 62 years?” You see, it’s more than a shiny red Victoria, it is an amazing story of a boy and his lifelong partner. I was lucky enough to hook Thom Taylor, he and his crew from Hot Rod Unlimited flew out to cover the 60th Anniversary event, see the video here. I let Don know I had some visitors that would like to meet him, we knocked on the door, Don poked his head out. “Don this is Thom Taylor from Hot Rod Magazine, he wants to see The Vic”, I said. Don looked him up and down, paused at the ‘Hot Rod Magazine Staff’ logo on the shirt. Now Don was no dummy, he subscribed to Hot Rod, he knew exactly who Thom Taylor was. Then he turned to me and said in his grumbuly voice, “Mike what have you done?” Ha Ha, it was priceless! You can read the article here. A photo Thom took of the two that day, in the very garage Don re-built the Vicky. He found ‘The Vic’ on South Pearl Street behind a service station. Don’s father told him he had to “sell the Cord to buy the Ford”, that was 1951, he joined the Strippers Car Club of Denver Colorado, built a ’48 flat head to 276ci backed by a 1940 Ford column shift trans (incidentally he pointed to that as the cause for not winning the 1953 hill climb). After his 1953 Hot Rod Hill Climb appearance he raced at Lowry Air Force base on Nov. 7, 1954 and was clocked at 72.46. 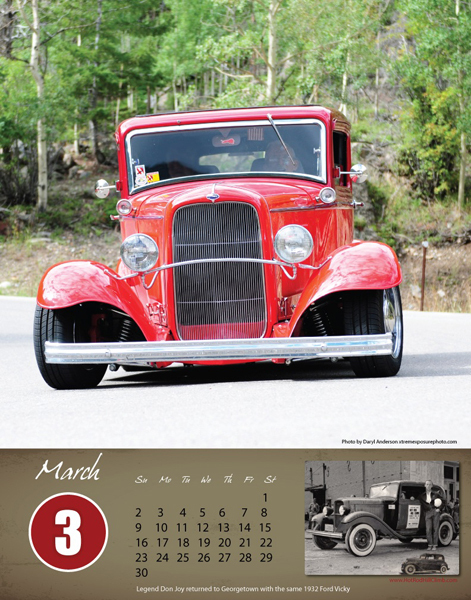 Don went to school at CU Boulder with Jim Nielsen, during that time the motor was pulled out and sat for many years. In 1960 he started to fit the chassis with a Dodge Red Ram, after finding out the block was cracked he started to fit a BB Chrysler in the rails, it was now 1964. Don’s dad was a devout Chrysler man, with that in his blood Don finally settled on a Dodge 360 for ‘The Vic’. During the mid 2000’s Don was able to rebuild the Vick to the Bright Red version most of us have come to know. Don was an avid body man for years working over many British cars, he applied those skills and had the body painted. With help Jim Nielsen, Bill Rush, Gary Nardi, and so many more he was able to enjoy ‘The Vic’ in his Golden Age. I’ve referred to this story as ‘Book Ends’, there were so many years in-between where the car was ‘on the shelf’, but the left and the right of that where Don’s Joy with ‘The Vic’. I’m honored he packed the O2 bottles in September and drove himself up the hill to relive the Hot Rod Hill Climb 60 years later. Some sweet moments with Don were captured by Adam Reynolds in this video, a must watch. Enjoy. Posted in All Posts, History, Legends, Photo.